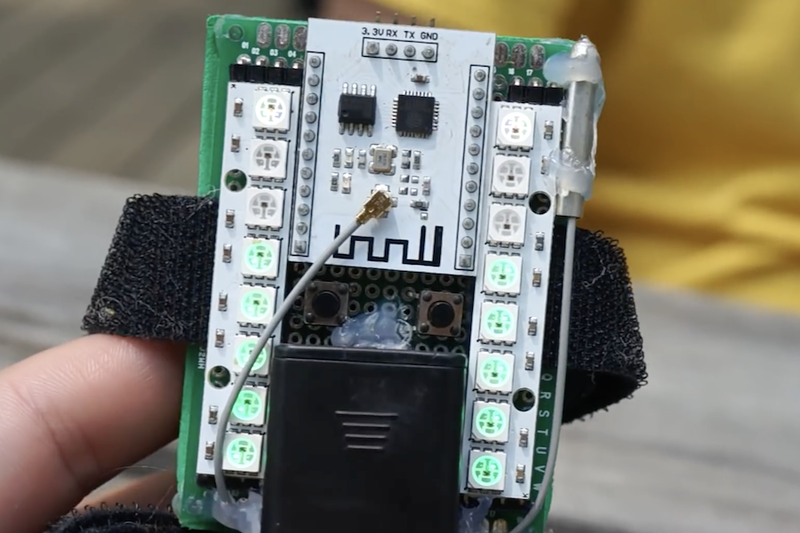 In this new Spy/Zombie Tag game, each player wears an LED-laden ESP8266 device, which displays either green to indicate zombie status, or white to show that the player is still a tasty human to be hunted down and converted. Two players are initially tagged as “zombies,” and once he or she comes in contact with a human, that player then joins the zombie ranks, represented by now-green lights on the ESP8266 module. Proximity to an opposing player is indicated by the device’s lighting system— which also counts down the game’s 15 minutes — providing another layer to the game’s strategy. Each unit works in AP plus station mode, searching for the opposing “Human” or “Zombie” SSID. This means that no infrastructure is needed, great for play at places like MAGStock where the demo video was filmed. While still a work-in-progress, the basic code for the game can be found on GitHub. Zombie Tag with the ESP8266 was originally published in Hackster Blog on Medium, where people are continuing the conversation by highlighting and responding to this story.